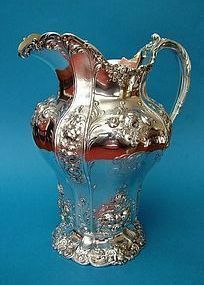 height 11; bottom diameter five, length across handle to spout 9 inches, weight 47.5 Troy ounces, retailed by Theodore Starr (maker's mark effaced) and monogrammed as shown. We always hesitate to say that an item is in "perfect" condition, but I am hard pressed to find fault with this one. Inverted pyriform, with 8 highly decorated alternating broad and narrow panels, the smaller sides with delicate rocker chasing to simulate a sand-cast appearance and provide contrast, the unbraided wrythen handle terminating in strands of rope which caress the body of the pitcher. Strong artistic merit allows this piece to make a bold statement without a hint of ostentation.